Published on August 23, 2014 in General T&T, Opposition Party, People's Partnership, PNM and UNC. 21 Comments Tags: Kamla Persad-Bissessar, Patrick Manning, Politics, Raffique Shah, T&T Govt. 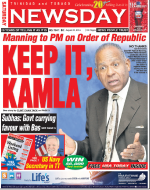 Patrick Manning was absolutely correct on all the reasons he cited for declining the Order of Trinidad and Tobago, as announced by Prime Minister Kamla Persad-Bissessar last Thursday. It is amazing that in just about everything she says and does, the PM gets it wrong nine out of ten times. The furore over her insistence on enacting and implementing the “run-off” provision in general elections still rages, yet she puts both feet in her mouth by publicly announcing that she has advised President Anthony Carmona to confer the ORTT on Manning and Basdeo Panday.